It's great to be hearing Donald Ray Johnson again. I loved the last CD he sent me so much that I awarded "Pure Pleasure" the 2008 BLEWZZY AWARD. Now he's back with another contender - "It's Time". The many musical contributors are: Donald Ray Johnson on vocals, background vocals and drums; George Phillips, Bill Eaglesham and Brent Wright on bass; Ralph Moncivais on tenor & alto sax solos; Ron Casat, Mike Little and Earl McCauley on keyboards; Alistair Elliot on trumpet; Mike Clark on sax; Dave Reed on trombone; Kent McCray on drums; Mike Huston, Brent Wright, Gaspard Ossekian, Russell Broom, Bill Johnson and Yuji Ihara on guitar; and Chris Aries on background vocals. The disc opens with a smokin' shuffle called "These Blues", one of Donald's originals. It's not just hot, it's a three alarmer. Backed up by prominent rhythm coming from Kent, Bill E. and Ron on the drums, bass and organ - not one, not two, but three guitarists provide some rhythm of their own. Fueling the fire are great guitar and sax leads by Gaspard and Ralph. We're off to a real good start here. "It's Time" is not only the title track but it's also a statement I'm going to say a little more about later. This original features Donald doing what he does best - expertly singing his heart out with emotion filled vocals. On this one, Russell is responsible for the great guitar leads. Paying tribute to his close friend of forty years, Donald does a great job on a song made popular by the late Phillip Walker - "Working Girl Blues". Great guitar and organ leads by Bill J. and Ron. Many politicians have said it, but when you hear the heartfelt way in which Donald sings it, it seems a lot easier to believe that a "Change Is Gonna Come". Of course they're all speaking materially while Donald's speaking spiritually. Having hymnal qualities, this type of song is perfect for Donald's style and voice. The background vocals and alto sax solo fit just right. "Watching You" is another hot one. It features Yuji Ihara at disc's best on guitar solos and Kent McCray teaming up with George Phillips on bass for the disc's best rhythm. That, along with the full horn section helping out, make this the disc's best track musically. With the band softly providing him with smooth background music, Donald shines on this one. His version of a "Rainy Night In Georgia" may actually be better than the original. His voice is so powerful, so soulful, so smooth, so emotional and so very articulate. Oh my God, can this man sing! This review will be long done and I'll still be hitting replay on this one. Great stuff Donald. Other tracks on "It's Time" include: "Heavy Love", "Girl Friend Blues", "Ain't No Fun To Me", and "Louisiana Country Girl". 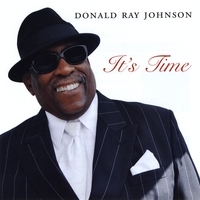 I don't know the reason why Donald Ray Johnson named this CD "It's Time", and from the tracks lyrics, there doesn't seem to be any relation to what I'm about to say. However, the way I see it, it's time this Grammy Award winning artist gets some recognition in the blues community. It's time to start seeing him on the bill at blues festivals and it's time to start seeing his name on some Blues Music Award ballots. To discover what I've already discovered about this great bluesman you need to go to www.donaldray.com . Read his bio, buy his CD and tell him the Blewzzman didn't send you there, he chased you there.